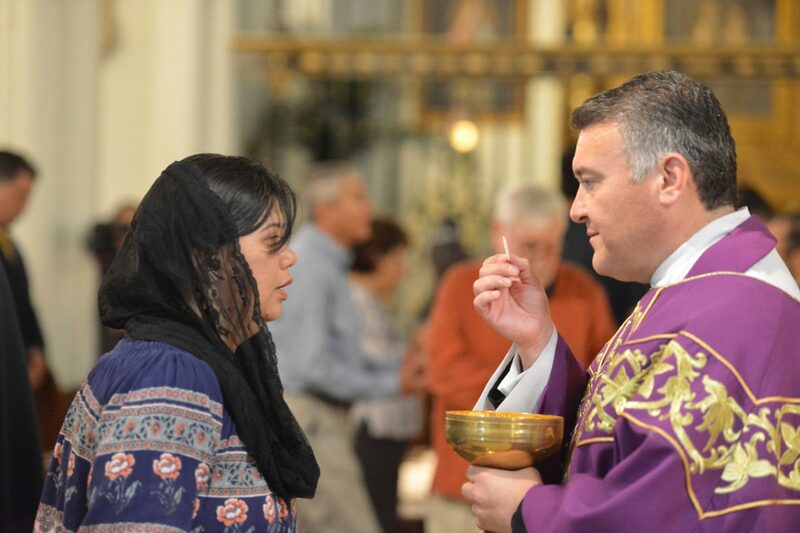 Father Mario Alberto Avilés of Sacred heart Church in Hidalgo gives communion to the faithful at Immacualte Conception Cathedral (ICC) in Brownsville Monday during mass as Pope Francis has named father Avilés as auxiliary bishop for the Diocese of Brownsville to assist Bishop Daniel E. Flores. SAN JUAN — Pope Francis has named Oratorian Father Mario Alberto Avilés as auxiliary bishop for the Diocese of Brownsville. The pope made the appointment at around noon Monday in Rome, making Avilés the first auxiliary bishop appointed in the diocese’s 52 years. Selected to assist Bishop Daniel E. Flores who, according to a diocese news release, is responsible for more than a million Catholics in the Rio Grande Valley, Avilés was born in Mexico City and has lived in the Valley since 1988, during the formation of the Oratory of St. Philip Neri in Pharr. He currently serves as pastor of Sacred Heart Church in Hidalgo and was described by Flores as an educator, a pastor and has been general procurator for the Confederation of the Oratory for almost six years. 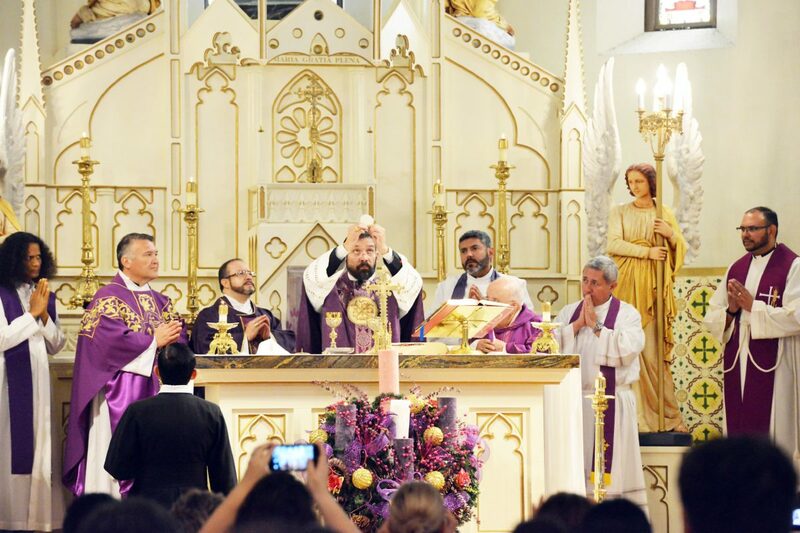 Bishop Daniel E. Flores celebrates mass during the liturgy of the eucharist Monday at Immaculate Conception Cathedral (ICC) in Brownsville as Pope Francis named Oratorian Father Mario Alberto Avilés, second from left, of Sacred Heart Church in Hidalgo, as auxiliary bishop for the Diocese of Brownsville. “He will bring his great gifts and place them at the service of all the people of the Rio Grande Valley,” Flores said of Avilés. Although Flores described the role of an auxiliary bishop as being ordained to assist the diocesan bishop in the “pastoral governance and sanctification of the diocese,” specific tasks for Avilés are not yet known. “I can’t point to anything specific,” Avilés said at a Monday news conference of what he might want to prioritize, but added he is excited about the post. The news conference was held at the Bishop Adolph Marx Conference Center at the Diocesan Pastoral Center in San Juan, located near the Basilica grounds. This is where Flores introduced Avilés on Monday. Flores and Avilés also attended a celebratory mass at Immaculate Conception Cathedral in Brownsville. Four of the 15 dioceses in Texas have an auxiliary bishop assigned. There are 83 auxiliary bishops, according to information provided by the diocese. Avilés’ Episcopal consecration is scheduled for Feb. 22. Brenda Nettles Riojas, diocesan relations director for the diocese, referred to the consecration as one of three historic elements of Avilés’ appointment. “I’m calling it a historical trifecta, because it’s the first time the diocese gets an auxiliary priest, and the first time a priest working in the diocese gets elevated to a bishop, and in February it’ll be the first time we have a bishop ordination in the Valley,” Riojas said. She noted that although James Tamayo, of Brownsville, and Michael Pfeifer, of Alamo, were also Valley natives elevated to bishop, they served for the Laredo and San Angelo diocese, respectively. “It’s a very exciting time and a joyful occasion for the Rio Grande Valley community because of the significance of this being a growing area and the attention we’re getting from the nation, being in the border region,” Riojas added. Asked about Avilés’ responsibilities outside of assisting Flores, Riojas said the two plan to decide as much soon. Also, the auxiliary bishop-elect said it was Archbishop Christophe Pierre, of the Apostolic Nuncio to the United States of America, who informed him of the pope’s appointment eight days ago. Staff writer Michael Rodriguez contributed to this report.